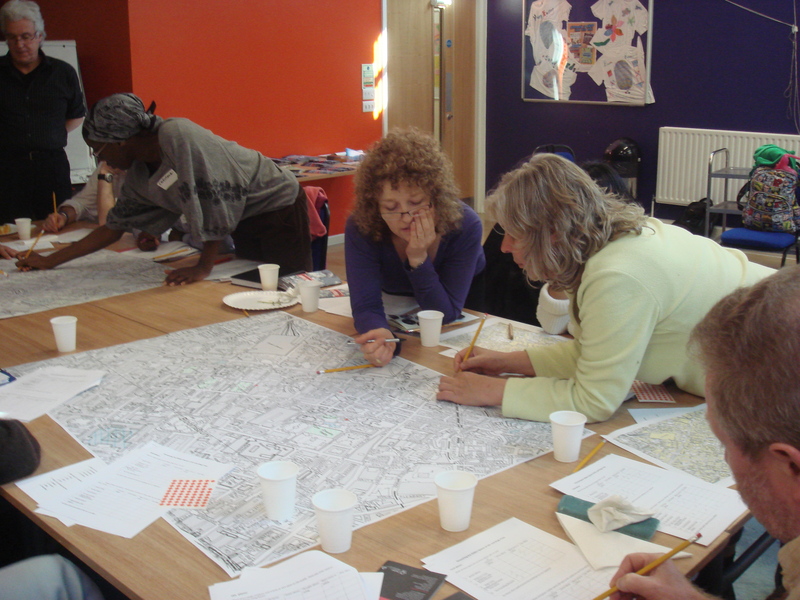 Participatory GIS and Public Participation GIS. In the 1990s, participatory GIS (PGIS) and Public Participation GIS (PPGIS) emerged as an approach and tool to make geospatial technologies more relevant and accessible to marginalized groups. The goal has been to integrate the qualitative and experiential knowledge of local communities and individuals, thereby empowering local peoples and non-profit organizations to participate in political decision-making. By enabling the participation of local people from different walks of life, P/PGIS has provided a platform where these people can share their viewpoints and create maps depicting alternative views of the same problem, but from a local perspective. Over the years, numerous applications integrating GIS and social and spatial knowledge of local groups have been developed. P/PGIS appears well articulated as a technique. With the growth of Information and Communication Technologies (ICT), from an epistemological view point the relationship of P/PGIS constructs (society, technology and institutions) and the use of components (access, power relations, diverse knowledge) in P/PGIS necessitates an exploration of what P/PGIS means in 21st century. A related field, Citizen Science a.k.a. public participation in scientific research is a research technique that allows participation of public in the discovery of new scientific knowledge through data collection, analysis, or reporting. This approach can be viewed to be somewhat similar in its implementation to P/PGIS, which broadens the scope of data collection and enables information sharing among stakeholders in specific policies to solve a problem. The success of all three concepts, citizen science, PGIS and PPGIS, is influenced by the Geoweb – an integration of the Information and Communication Technologies (ICT) (e.g., social networking sites) and geospatial technologies (e.g., virtual globes like Google Earth, free and open source GIS like QGIS and location enabled devices like the iPhone) – that allows a platform for non-experts to participate in the creation and sharing of geospatial information without the aid of geospatial professionals. Following a successful session in the AAG 2015 Annual Meeting, this call is for papers that will appear in a special issue of ‘The Cartographic Journal’ (http://www.maneyonline.com/loi/caj). We are calling for reflections on PPGIS/PGIS and citizen science that address some of the questions that are listed below. What social theories form the basis for the current implementation of P/PGIS? Have these theories changed? What remains persistent and intractable? What role do spatial theories, such as Tobler’s law of spatial relations or issues of spatial data accuracy, have in P/PGIS, Citizen Science or crowdsourcing? Since Schlossberg and Shuford, have we gotten better at understanding who the public is in PPGIS and what their role is in a successful deployment of PGIS? Which new knowledge should be included in data collection, mapping and decision-making and knowledge production? To what extent are rural, developing country, or marginalized communities really involved in the counter-mapping process? Are they represented when this action is undertaken by volunteers? What role do new ICTs and the emergence of crowdsourcing plays in the inclusion of indigenous and local knowledge? Do new tech and concepts hinder the participatory process or enable empowerment of local communities? Do we have new insights on what could be considered technological determinism? Do we need to revisit P/PGIS in light of any of these shifts? How often do P/PGIS projects need to be revisited to address the dynamic nature of society and political factors and to allow future growth? How effective have P/PGIS and Citizen Science been in addressing issues of environmental and social justice and resource allocation, especially, from a policy-making perspective? Are we any better at measuring the success of P/PGIS and/or Citizen Science? Should there be policies to monitor citizen scientists’ participation in Geoweb? If so, for what purpose? What should be the role of privacy in P/PGIS, for example, when it influences the accuracy of the data and subsequent usability of final products? How have our notions of needed literacy (e.g., GIS) and skills shifted with the emergence of new technologies? How has the concept of the digital divide been impacted by the emergence of the Geoweb, crowdsourcing and/or neogeography? What is the range of participatory practices in Citizen Science and what are the values and theories that they encapsulate? What are the different applications of Citizen Science from policy and scientific research perspective? To what extent do the spatial distribution of citizens influence their participation in decision making process and resolving scientific problems? How have our notions of needed literacy (e.g., GIS) and skills shifted with the emergence of new technologies? Editors: Muki Haklay (m.haklay@ucl.ac.uk), University College London, UK; Renee Sieber (renee.sieber@mcgill.ca), McGill University; Rina Ghose (rghose@uwm.edu), University of Wisconsin – Milwaukee; Bandana Kar (bandana.kar@usm.edu), University of Southern Mississippi – Hattiesburg. Please use this link to send queries about the special issues, or contact one of the editors. • Paper – The final paper created following the guidelines of The Cartographic Journal must be submitted by 30th October 2015. The special issue is indeed out. Here is the editorial for the special issue and here is the special issue itself. If you don’t have access to the paper, email the authors and they can send you a copy of their paper.